For months now, Representative Ilhan Omar (D-MN) has been espousing racism and anti-Semitic language repeatedly, as she proclaimed that Israel was evil and was hypnotizing the world Then, she claimed that support for Israel was because of Jewish money, or as she put it “ALL ABOUT THE BENJAMINS”! However, most recently she pushed an anti-Semitism conspiracy theory that her Jewish colleagues were in support of Israel because they have a dual allegiance to the State of Israel! , and for holding secret fundraisers for groups with ties to terrorism, and waged war on America and Israel! Sadly, the Democrats continued to stand by her, as she has proven to be an anti-American cancer, who not only hates the very fabric of America and our Constitution, but she hates the American people themselves! Now, Rep. Ilhan Omar (D-MN) is under investigation for using her campaign funds to pay for personal travel expenses, and for her divorce lawyer, when she separated from her ex-husband, and brother! YES BROTHER! 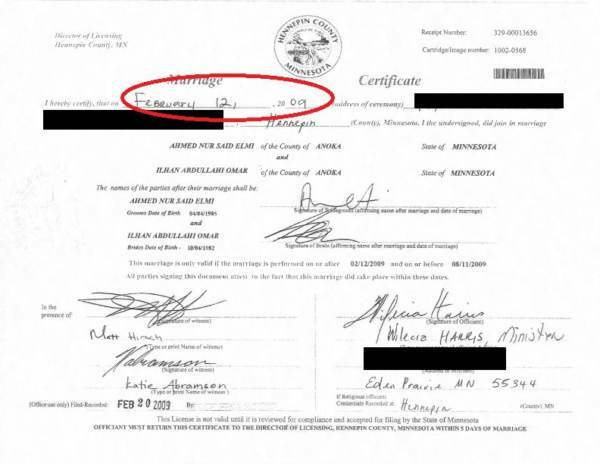 Reports indicate that Ilhan Omar married Ahmed Nur Said, who happens to be her brother on February 12, 2009, and divorced him in 2017. It is also alleged that her reasoning for marrying her brother was to defraud the US immigration system. Therefore, it is of NO WONDER, AS TO WHY SHE IS PUSHING FOR ILLEGAL ALIENS TO HAVE UNFETTERED ACCESS TO AMERICA! authorities have recently completed their investigation and are preparing to issue a ruling. Omar has said elsewhere that the payments to her divorce lawyer reflected compensation for legal services rendered to one of her state campaigns. In an editorial published Oct.12, the Minnesota Star-Tribune called on Omar to provide more information about her campaign spending, saying “Fifth District voters deserve a fuller response” on the travel allegations. Investigative reporters asked Omar about the alleged campaign finance violations, but she refused to comment, and her aide told Sinclair that they should try to schedule an interview with Omar, but she refused to respond to the email inquiries as well! However, what the Democrat Representative did do was to weaponize her Muslim faith and female gender, calling anyone who dared question her or investigates her alleged improprieties a racist, Islamaphobe, and anti-feminist! Now, according to sources from Sinclair, the campaign finance board has completed their investigation of both complaints against Ilhan Omar, including one related to using funds to pay her divorce lawyer, and the other for issues related to travel expenses! They said that there will be a ruling issued within the next 4 – 6 weeks, and will issue a ruling within the next 4 to 6 weeks.